This boy’s dinosaur birthday party is outstanding! Little Jaxon loves to play dinosaur. In fact, since one of his first words was “roar” he earned the nickname of “T-Jax”. Mom Kelli, of KLM events, knew her theme idea of “dinosaur” would definitely work for Jaxon’s second birthday party. Dinosaur decorations and a dessert table with dinosaur silhouettes dancing around a volcano cake set the tone for a delightful boy birthday party. If you’re looking for some great birthday ideas, check out my 10 Dinosaur Party Must Haves. 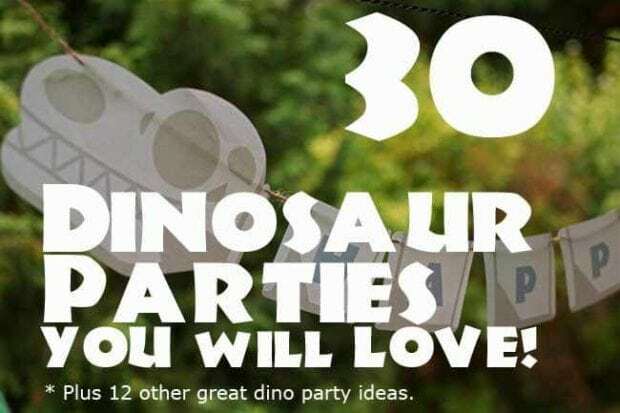 Plus, get some more great inspiration from this gorgeous dinosaur party. You can’t help but notice the huge “T-Jax” dinosaur over the dessert table. The terrific backdrop was drawn by the birthday boy’s talented aunt, Amy Greenwood. 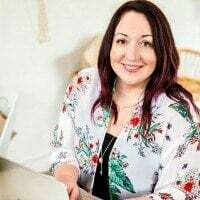 I love how Kelli wove greenery swags in with the “Rawr” banner to front the burlap skirted table. She masterfully built mini-dino displays around the food. The wood and greenery look great with this theme. The variety of serving levels makes for a more interesting table, too. Especially clever is the use of oversized leaves as serving platters. A log looks super holding cake-pops at the ready. Kelli’s party food choices include food for herbivores (veggie cups) and carnivores (pigs in a blanket). Where it was possible Kelli gave her food choices themed monikers such as Dino Bones (white chocolate covered pretzel sticks and marshmallows), Dino Dig Dirt Cake (served in chocolate “grass”), Chocolate Rocks, and Dino Sugar Cookies. Additional foods included chocolate covered Oreos with fondant dinosaur toppers and Oreo truffles shaped like dino eggs. “Swamp” juice delighted the kids. I like Kelli’s idea of using Mason jars and canning rings with cupcake liners for anti-spill tops. Arrangements of plants, dinosaurs and chocolate rocks decorate the guest tables. The predominate browns and greens look early-earth dinosaur age, but the complements of orange, aqua and yellow keep things cheerful—nice combo! A paint craft was set up on the tables inside and there were also outside activities planned. A dinosaur piñata was a fun way to burn off some kidlet energy. A 12′ x 12′ sandpit was built just for the party. Kids had a blast digging for mini dinos from the dollar store and looking for the dinosaur eggs which had been filled with money prizes. All details culminate in a feast for the eyes and produce a sensational birthday party! Little Jaxon looked adorable in his dinosaur t-shirt and tail; I don’t think he looks scary enough to terrorize his neighborhood, but I’m sure this party gave him more to roar about! Check out more of Kelli’s work by visiting her on Facebook. Check out more great dinosaur birthday party ideas.